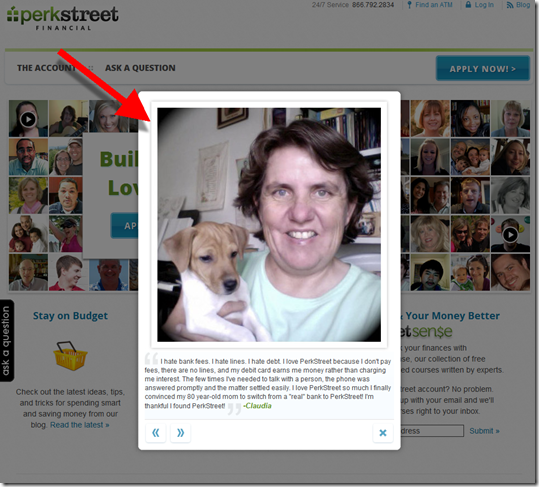 Not surprisingly, Google served a PerkStreet Financial ad in my Gmail account tonight (8:30 PM Pacific). I barely remember clicking it, but I started paying attention when I saw the virtual bank’s landing page (see first screenshot; note 1). 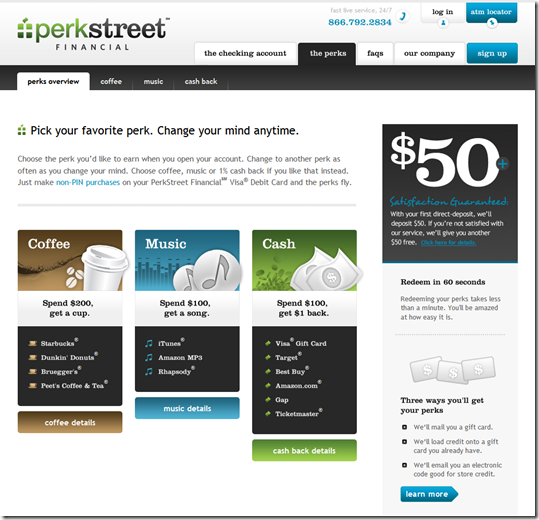 PerkStreet uses a clever visual technique, one that’s familiar to Facebook users (note 2; fourth screenshot), a montage of "friends." 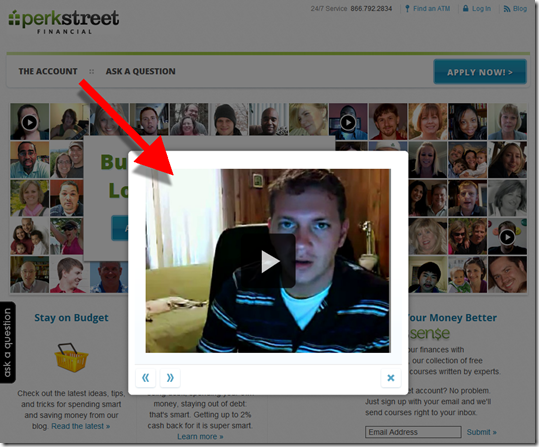 In this case, they are not actual friends but 53 thumbnail photos each containing a customer testimonial via either webcam (18 of the thumbnails; second screenshot) or static photo with caption (35 thumbnails; third screenshot). The bank tops it off with two easy-to-see Apply Now buttons. Nicely done. I Like it. 1. I am calling it virtual because they are a pass-through to a third-party bank that holds the funds. 2. 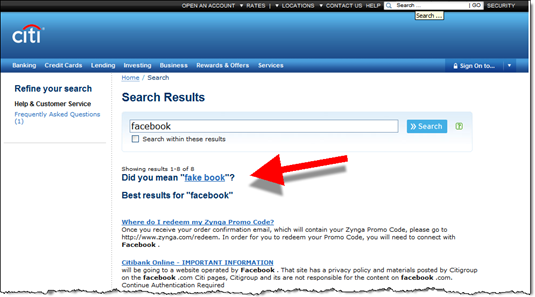 See our latest report, Banking on Facebook, published yesterday. I was doing some research into banks’ Facebook sites and found a couple pretty terrible results when using each bank’s own search feature. Here are three samples. Chase has more Facebook fans (3.4 million) than any bank on the planet, in fact almost 4x the nearest competitor. But you wouldn’t know if from their site search, which returns exactly zero useful results. It looks like US Bank’s site search is broken today. Every search comes up with the same error message. Too bad there isn’t a better error message. “We could not process your request” sounds a bit like they are shifting the blame to the user. Note: We’ve covered banking site-search in our Online Banking Report industry newsletter (subscription). 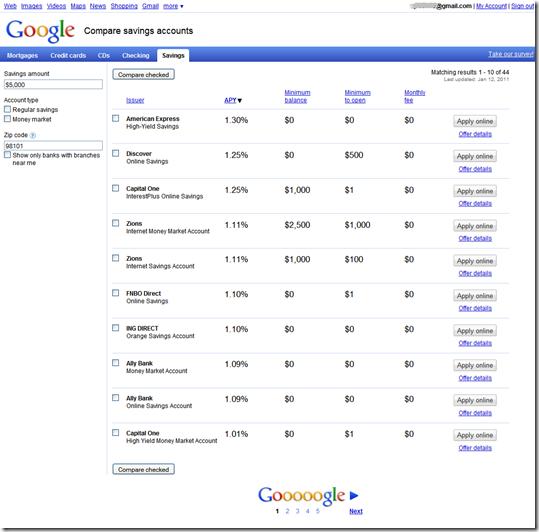 Today, I ran into Google’s new savings-account comparison chart for the first time (see notes 1, 2 and screenshot below, link). The search giant now offers separate pages with financial product comparisons for mortgages, credit cards, CDs, checking, and savings accounts. And the comparison matrices are at times positioned prominently on searches potentially reducing traffic to top advertisers and to organic results as well (see screenshot below). I still don’t understand why Google would risk antagonizing its financial advertisers by drawing traffic away from their ads and into the Google-powered comparison matrix. The company says its focus is on the user experience. So I guess they believe that long-term this approach will generate more traffic, more searches and ultimately more revenue, possibly from commissions for actual accounts generated, rather than just pay-per-click. But in its current beta stage, there are some odd results. 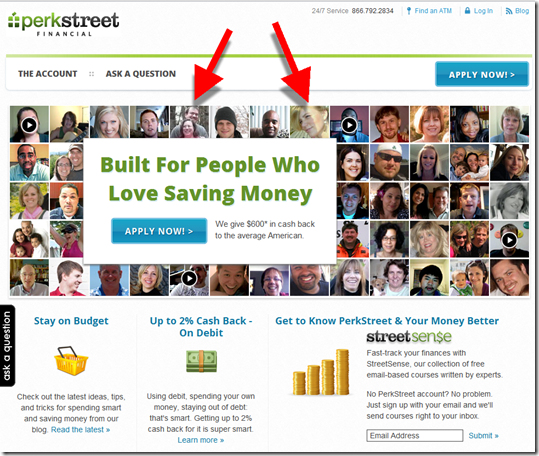 How would you feel if you are US Bank, bidding high enough to be number three on the search results page, but not shown until page three of the savings-account comparison page? Worse, three top-10 advertisers, BECU, Navy Federal CU, and TD Ameritrade aren’t even listed on the savings comparison page. Which brings up a bigger question. How does Google determine which FIs are listed? The savings-product comparison indexes only 17 banks, of which five aren’t even playing the rate game at this point with rates of 0.25% or less (note 4). Furthermore, there’s not a single credit union and just one smaller bank (Bank of Internet) listed. I understand this is just a trial balloon from Google and that product comparisons could make it easier for users to find the best rate. But right now it’s unfair to any financial institution not in the chosen 17, and it doesn’t allow users to easily choose from criteria other than rate, monthly fee, and whether a branch is nearby. It also looks like the system could be gamed. What’s to prevent one of these banks from launching ten, or 20 or 30 different savings accounts, all with temporary teaser rates, to soak up more space in the matrix? Sure, Google will eventually build algorithms to prevent that, but that will take time. Meanwhile, it’s an odd transition time for the search engine and its financial advertisers. But if you rely at all on Google to deliver new customers, you better pay close attention to developments with its product-comparison pages. 1. 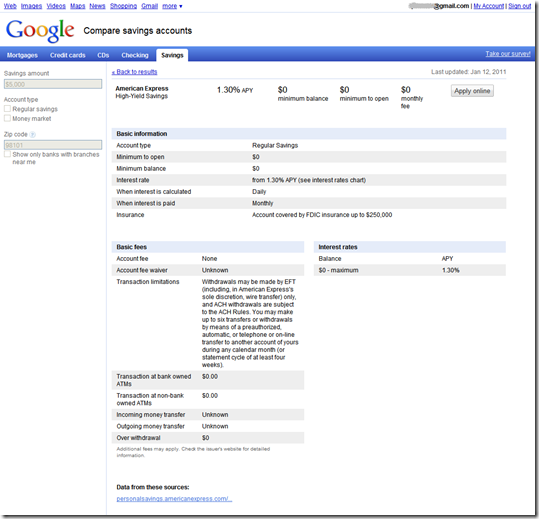 According to MyBankTracker.com, Google started running the deposit-account comparisons in late December 2010 in the U.S. market. 2. 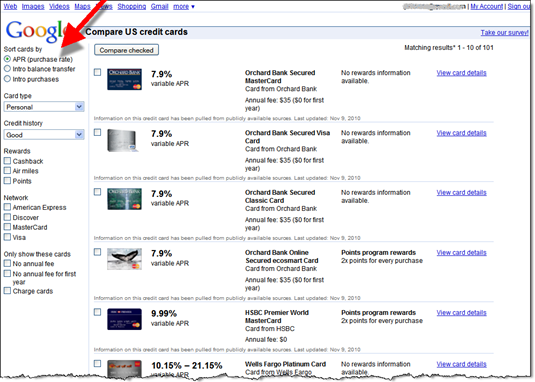 We wrote about Google’s credit card comparison matrix in November. 4. 14 of the 44 results, almost one-third of the matrix, were accounts paying 10 basis points or less. 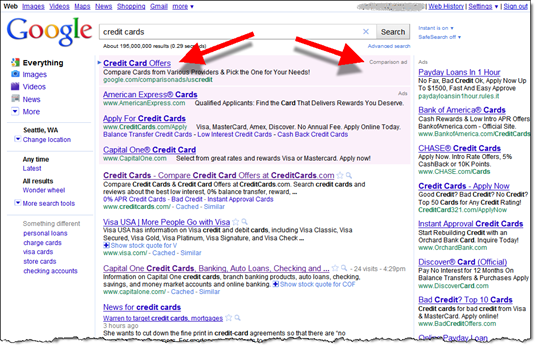 Today, when searching Google for “credit cards,” a small Comparison ad appeared on the top of the results page, above the individual paid spots (see first screenshot below; note 1). The title was “Credit Card Offers” and clicking on it delivered me to the following URL: google.com/comparisonads/uscredit (see second screenshot). Google had previously disclosed United Kingdom tests for credit card and mortgage comparison ads, but this is the first I’d heard of them in the United States (note 2). The comparison page had 101 credit card offers that could be searched based on certain card attributes such as “no annual fee” and/or by the user’s self-evaluation of their credit quality. Clicking on one of the offers delivered a page that summarized the salient points, but according to the fine print at the bottom of the page, Google isn’t currently being paid for these credit card ads. However, there was a source code in the URL that delivered me to the U.S. Bank application, so Google may be banking referral fees for completed applications. If this practice becomes widespread, card issuers will need to adjust their Google search buy and figure out how to gain better exposure on the comparison-results page. Right now, APR (interest rate) is the default sort mechanism. 1. Searching from a Seattle IP address on 10 Nov. 2010 at about 5:00 PM Pacific Time via Firefox 3.6 on WinXP. 2. Apparently a few others have seen them; for example, Search Engine Journal reported on the practice in an October post (here). With growing debit card usage, and few rewards programs with meaningful payment bonuses (note 1), the market seems right for a focused debit-card-rewards provider. But the market has not evolved as fast as many thought. Capital One threw in the towel on its decoupled debit rewards program. Finovate alum (video here) Tempo Payments is refocusing on affinity-branded cards, which often have a reward component paid for by the affinity partner. 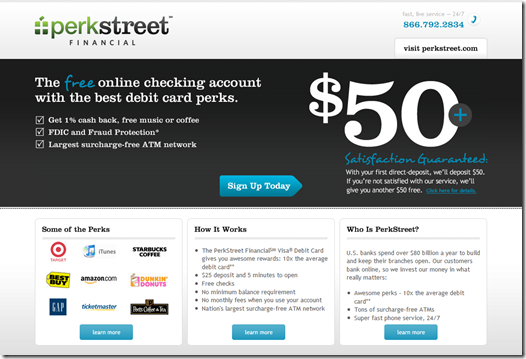 But a new entrant, PerkStreet Financial (powered by The Bancorp Bank) may have the right answer: reward levels on par with credit-card programs, 1% of spending value, 4x the average debit card program (note 1). The company emphasizes rewards paid via free coffee (nice tie-in to the name), music downloads (going after the youth market), or gift cards from name-brand retailers (adds retail interest to the account). See the first screenshot. But with lower interchange, and no monthly fee (note 2), how can a bank afford such high rewards? $50 new-account bonus: If you navigate directly to the website, there is no new account bonus (see screenshot 2). 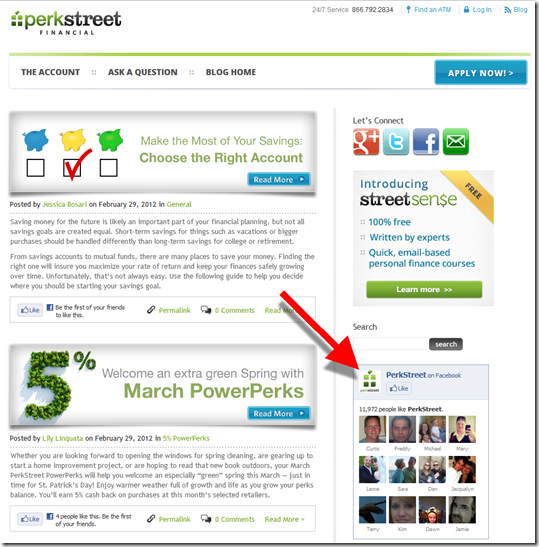 But if you use Google, it’s hard to miss PerkStreet’s ad (screenshot 3) or the affiliate deals. Going to the site through those options earns you a $50 bonus (screenshot 4), and in the case of the Google ad, an additional $50 qualified satisfaction guarantee (screenshot 5). $50 bonus now with direct deposit, and $50 more if not satisfied within eight months. To qualify as not satisfied, you must have set up direct deposit within 60 days of account opening, made 10 or more debit transactions per month for six straight months, and have closed your account within eight months of opening. 1. 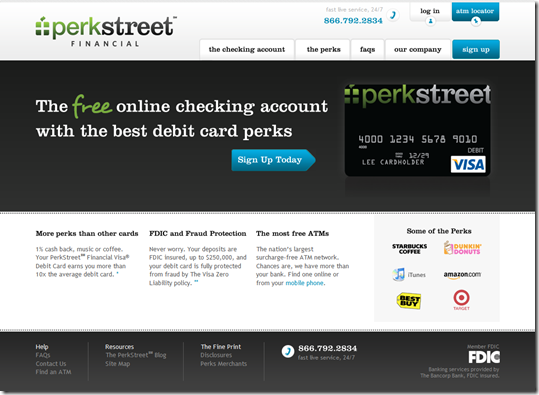 According to the fine print disclosures on PerkStreet’s homepage, 17% of debit cards provide rewards with an average value of 0.23% of spending (source cited: BAI/Hitachi 2008 Study of Consumer Payment Preferences). 2. The account has a monthly fee ($4.50) only if there is no activity. What Does Google’s Possible Entry in to Mortgage & Loan-Rate Aggregation Mean for Banks? Thanks to information in LendingTree’s lawsuit (embedded below) against its rate-engine provider, Mortech (see note 1), which was picked up by the NY Times, then echoed across the Internet, Google appears to be looking at providing loan rate comparison/aggregation directly in its search results. The service appears to have been beta-tested in the UK more than a year ago (screenshots here). It’s no surprise Google would make this move. It’s long worked on ways to help online shoppers compare products and services. 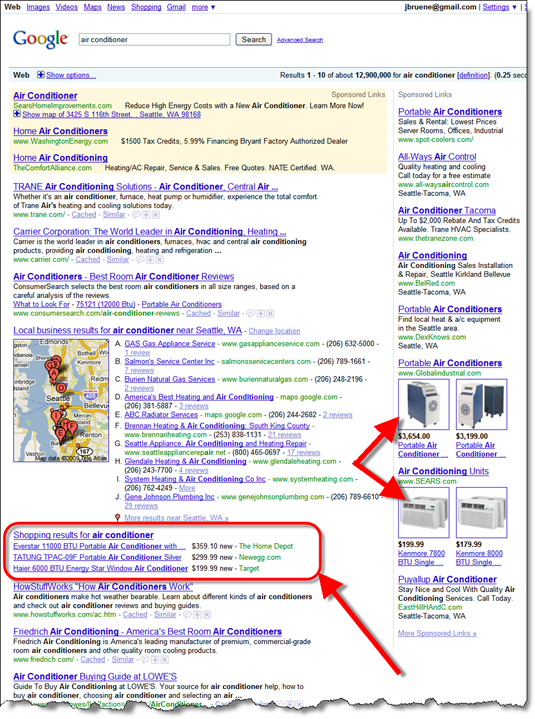 For example, a search today on “air conditioner” displays the usual targeted text ads on the top and right, but also shows various “shopping results” in the middle of the page (see screenshot below). There are even catalogue-like thumbnails in the right-hand column, something I’d not noticed before. Financial services, with heavy search volumes, are an obvious area for expansion by the search giant. What it means to NetBankers: The service, if successful, could help users streamline their rate-research process by eliminating a visit to a loan-comparison site. But it’s not likely to have a material impact on banks, credit unions and other mortgage lenders. 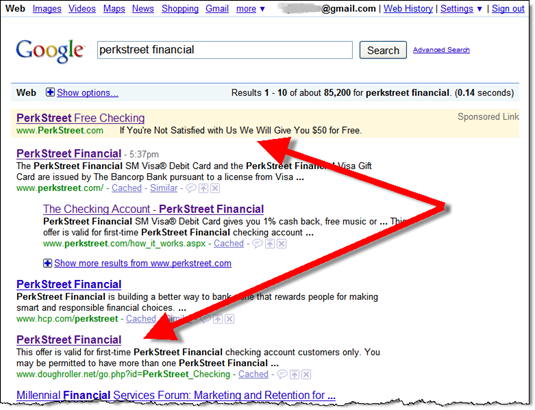 There will just be more advertising dollars ending up in Google’s pocket at the expense of other financial lead-gen sites such as BankRate.com, Interest.com and LendingTree, of course. 1. LendingTree claims that Mortech, an info provider to LendingTree, would be in violation of its contract if it provided similar technology to Google. See LendingTree’s press release on the matter. 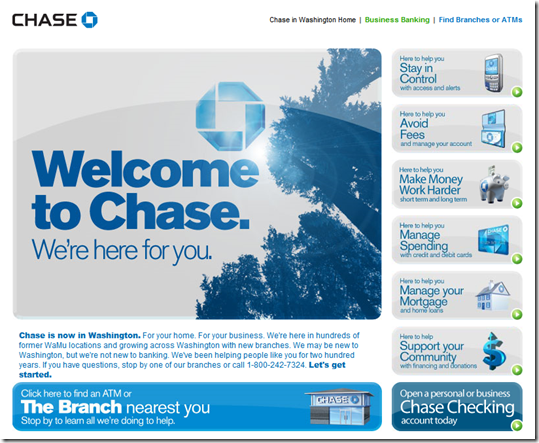 Someone’s getting creative on Chase’s search-engine marketing team. Look at the ad they placed on the RSS feed of a recent Payments News article (see first screenshot below, note 1). 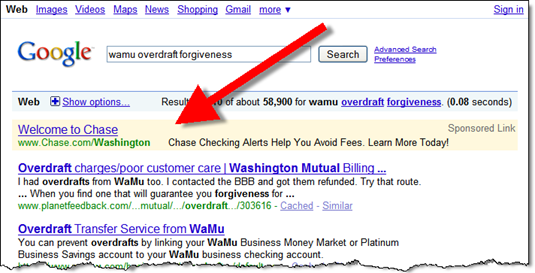 Using Google AdSense, the bank cleverly placed an ad against a story about Wells Fargo’s same-day bill pay service. Prospects that clicked through on the first ad landed on a microsite with a large branch finder at the bottom. This is a good microsite, although it doesn’t directly mention taking control of your finances (see second screenshot). Chase Checking Alerts Help You Avoid Fees. Learn More Today! These search ads were not displayed in searches today, so perhaps they were pulled after performing poorly. Lesson: There’s a lot of attention in the press these days about overdraft fees (see NY Times editorial today). If you have good tools to avoid them, especially mobile alerts, it might be an effective way to attract new customers. And even though these particular ads may not have worked, it demonstrates that Chase is being creative in its search engine marketing efforts. The only way you can find what works in your market is by continuous trials (note 2). 1. Viewed in a soon-to-be-defunct NewsGator reader. 2. 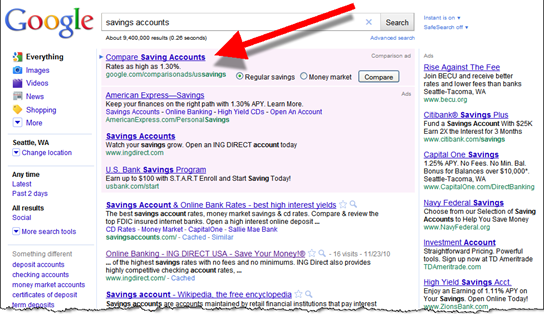 For more info on search engine marketing, see Online Banking Report: Searching for Customers 3.0 (March 2008). I don't know if Wells Fargo has saturated the entire Seattle market, or just the radio station I listen to, but I've heard its ad for a web-based retirement tool a dozen times in the past week or so. I like the radio spot. It takes a complicated subject and creates interest by asking, "What is your RSI score?" 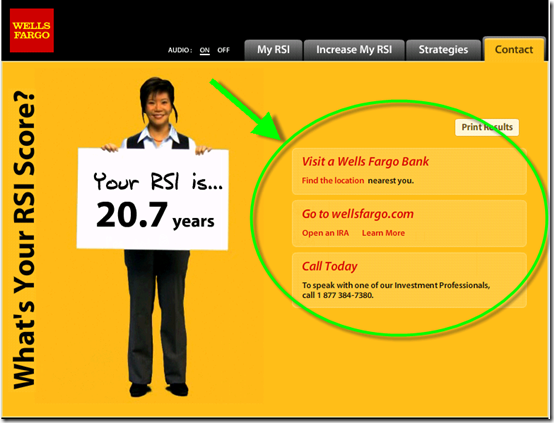 Then, sending listeners to the Web to take the bank's Retire Secure Index test. It's interactive, it's timely and it makes good use of a multi-media approach. And Wells Fargo uses search engine marketing masterfully to ensure that interested prospects find their way to the bank's retirement landing page. 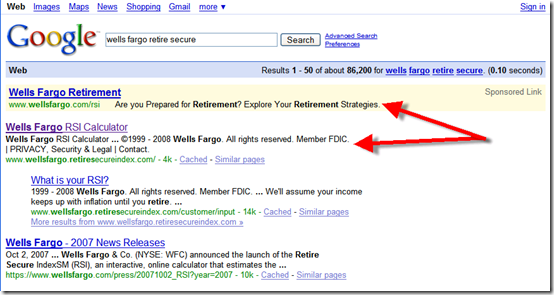 The bank has purchased Google AdWords for various retirement terms (see first screenshot below) and created a unique landing page (second screenshot) and URL <wellsfargo.retiresecureindex.com> that has quickly moved to the top of the organic search results (see note 1). The tool itself is good. It's not easy to make a retirement savings worksheet compelling, but the bank does about as good a job as you can expect. After a 60-second intro by the friendly virtual spokeswomen (see second screenshot), the user completes a short form that takes about two minutes. The on-screen spokesperson talks you through it, but I tuned her out since it's relatively straightforward stuff (note 2). After a few seconds of calculation, and a clever drum roll, Wells delivers an RSI number (see third screenshot), which is the number of years you can maintain your desired income level after retiring. It's a good way to present the results, focusing on the positive. Users can go back and change the inputs or go into advanced mode to add home equity, business equity and/or part-time employment. At the end, users are encouraged to contact the bank through a branch or toll-free telephone number to talk to an investment rep. There is also a link to open an IRA online. All in all, it's a good effort to engage users with a difficult topic. 1. For more information on search engine marketing for financial institutions, see our latest Online Banking Report (here). 2. The audio can be turned off, but the spokesperson cannot be made to sit down or go away (see note 3). 3. The first option on the original landing page is to choose "dial-up" or "high speed" versions of the tool. The dial-up version does away with the audio/video track and just presents the static form. 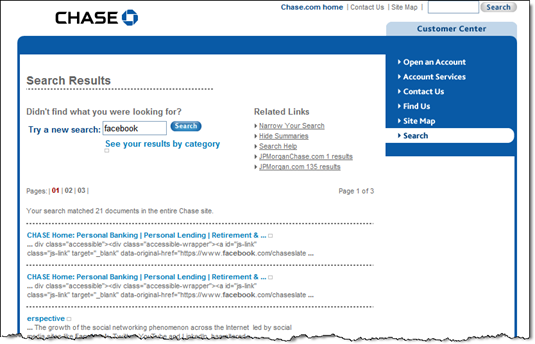 We just finished the latest from our Online Banking Report, entitled Searching for Customers 3.0 (see note 1). The report takes a fresh look at search engine marketing for financial institutions including local search, financial keyword selection, how to leverage social media such as blogs to improve your organic results, and more. It’s 36 pages long with 11,000 words and 28 tables. The report includes overall search marketing trends and metrics. We also dive deep into the most popular financial search terms and to help you uncover new ideas for your own search marketing tactics. Online Banking Report subscribers may download the report here. All other may purchase it for US$245 (single user) here. The abstract is available here. 1. 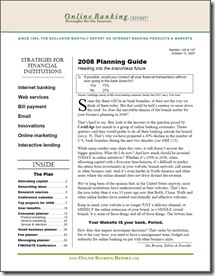 The “3.0” in the report title means it’s the third time we’ve covered this subject during the 13-year history of Online Banking Report. We also looked at search in April 2003 (OBR 95) and June 2001 (OBR 69) when Google AdWords was just getting rolling.